What Was the Great Migration and Why Do We Care? Between about 1630 and 1640, as many as 20,000 men, women and children left England for New England. Most if not all of the settlers of Lenox can trace their roots to this hearty group of emigrants. Who were these emigrants and why did they come? John Winthrop organized a fleet of ships to transport the emigrants, but it was a reflection of individual households making similar decisions – not an organized group. The emigrants included indentured servants and household servants but the decision makers were primarily farmers and merchants who could generate enough capital, generally by selling their holdings in England, to pay for passage and enough supplies for the passage and a year in the new land. Also carpenters (Joiners), tanners and other skilled trades were in great demand and could sometimes get their passage paid. Three quarters of the emigrants to New England were not members of the Puritan church but the Puritan beliefs characterized the group. 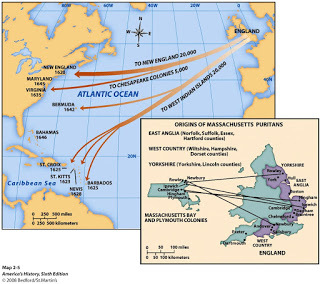 The time of the migration coincides with the height of the persecution of the Puritans under Charles I and ends with the outbreak of the Civil War that ended the reign and the life of Charles I. The beginning of the exodus coincides with the dissolution of Parliament in 1629. Although the ostensible purpose for the emigration was to escape religious persecution, it was undoubtedly also a hope for better economic opportunities. In England population growth had exploded without any great increase in agricultural productivity and the primary industry, wool, had been seriously hindered by the 30 years war in Europe. In addition, Charles I was warring with Scotland (and looking for the money to pay for it) at the same time he (and his Catholic wife) were warring with the Presbyterians of Scotland and the Puritans of England. homogeneous in religious believes and background. And, like most other emigrants of the era, self selected to be healthy enough to survive the arduous voyage and difficult first several years. Also, like other emigrant groups of the era, there was a great premium on creating your own labor force combined with cleaner water and less crowded living conditions. The result was remarkably large families. For all of these family members to find adequate farm average they had to further migrate north and west – often to the Connecticut or later Housatonic River Valleys. Hence, many descendants spread over the early Massachusetts settlements, some of whom would find their way to Lenox. Jonathan Hinsdale (first known settler of Lenox) – was born in Hartford, apparently the great grandson of Robert Hinsdale, born 1617 in Dedham, Essex, England and who died in 1675 at Bloody Brook (near Deerfield) – part of the hostilities of King Phillip’s war. Jonathan apparently came from a long-line of risk takers..from England to an unsettled area (Deerfield) and to an unsettled area again (Lenox). Israel Dewey (an important member of the initial purchasers of Lenox open land in 1762) was the great-great grandson of Thomas Dewey born 1606 in Sandwich, Kent, England. Thomas Dewey apparently moved at least once after landing as he died in 1748 in Windsor, CT. The various locations of his parents, grandparents, etc. suggests Israel came from a long line of real estate entrepreneurs – his grandfather, Thomas Dewey, was among the original settlers of the Berkshires coming from Westfield to Sheffield. And, indeed, Israel him self would die, not in Lenox, but in Vermont in a another new community he had participated in launching. And, of course, Grenville Winthrop, an important part time resident who lived at the current BUTA campus on West Street was a ninth generation descendent of John Winthrop.